A file photo showing Abang Johari and his entourage taking a look at a hydrogen-powered bus in Shenzhen, China, last year. KUCHING: Parti Bansa Dayak Sarawak Baru (PBDSB) wants the deferred light rail transit (LRT) project to be scrapped altogether, and for the public transportation system to be improved and upgraded to ensure efficiency. Its president Cobbold John said he appreciated Chief Minister Datuk Patinggi Abang Johari Tun Openg’s move to postpone the LRT project, but it would be better to cancel the project altogether and instead focus on improving the bus service in Kuching and surrounding areas. “I suggest that the chief minister let the next generation of leaders to worry about the LRT. The Sarawak government, under his leadership, should start thinking seriously about improving the bus service instead. Cobbold believed there is no serious public complaint about air pollution caused by the buses. “He (Abang Johari) should also not insist that bus companies use hydrogen-powered buses to ply the streets of Kuching. I believe diesel-powered buses will not cause much pollution. Diesel-powered buses were used in the past, and nobody complained. “What is important is the bus companies provide efficient service,” he said. According to Abang Johari, the postponement would pave the way for Sarawak to focus on rural development. He conceded that the LRT project was no longer a top priority as far as Sarawak’s development agenda is concerned. He said this after chairing PBB Supreme Council meeting at the party’s headquarters here. 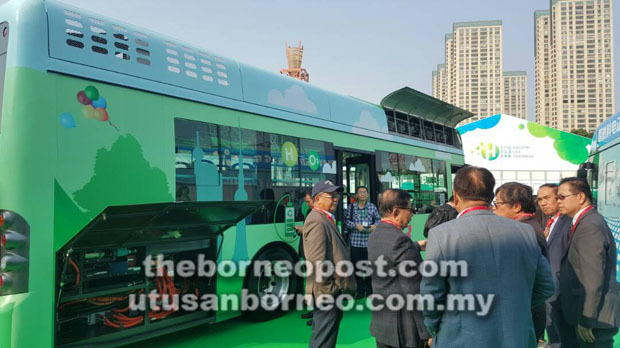 On Dec 10, 2017 Abang Johari said Kuching would be the first city in the country to have hydrogen-powered buses on its roads. Three of such buses were supposed to arrive here from China in July. He said the project was part of the hydrogen research and development programme undertaken by Sarawak Energy Bhd (SEB), and that the Sarawak government would allocate RM10 million for the research programme to be carried out by SEB under its Hydrogen Research Unit. gas to power the buses, he said then. worldwide trend to protect the environment.